Raised so far: £2,735 THANK YOU! Thank you to everyone that has helped and supported us! Purchased an A frame which makes the piano more safely and easily moved. The piano cabinet will be assessed for damage and recommendations for repairs/restoration to bring it up to concert standard. Community Key C8 has raised £470 so far – Thank you! The piano was on its way to the scrap yard from a concert hall when Mersey Wave originally found it six years ago. Parish Priest of St Ambrose Church Fr Ed Cain, recognising the value of music making for the whole area, kindly enabled Mersey Wave to give the piano a brand new home at the church and open up the church for anyone to enjoy the music. The church is the largest in Liverpool and the piano served us all so well – it has been an essential part of collaborative music making which has enabled so many people to enjoy the local concerts and experience live music. The piano has been through a lot over 100 years and would now need lots of refurbishment to get it concert ready. 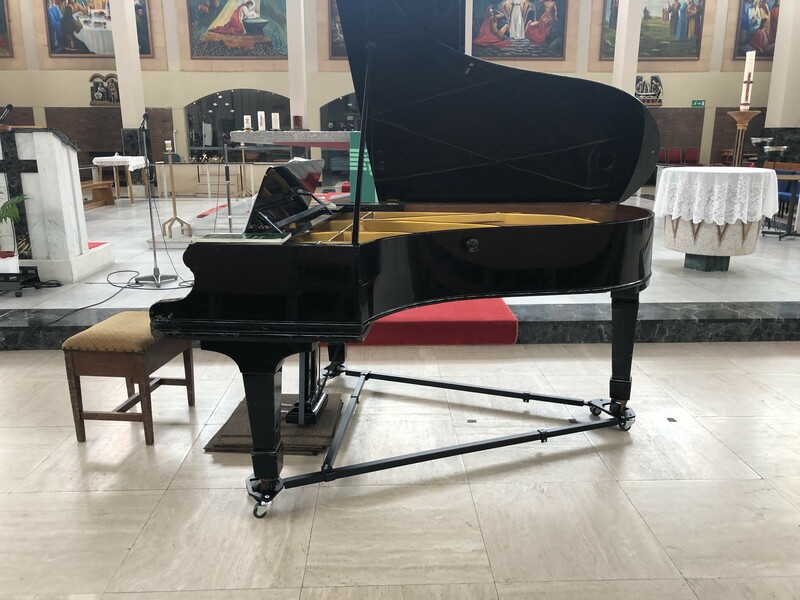 We feel it is now the right time for Mersey Wave to restore this piano or invest in a new good condition grand piano that can serve our community and music lovers further. Having a grand piano within our local area is an asset to us all as a community. It’s what originally inspired and gave us the opportunity to create the music events in Speke with the Community Choir and Young Singers Groups. It is so important that we can all recognise the value of having musical instruments that are accessible for children and adults to experience and enjoy within local communities and the wonderful legacy that it creates for the future. We will do all we can to continue to keep developing creativity and generate enthusiasm for live music making to its fullest potential here in St Ambrose. But we need some help to get a piano that’s back in action here in Speke so we’ve launched the Mersey Wave Grand Piano Appeal to help raise funds towards this. 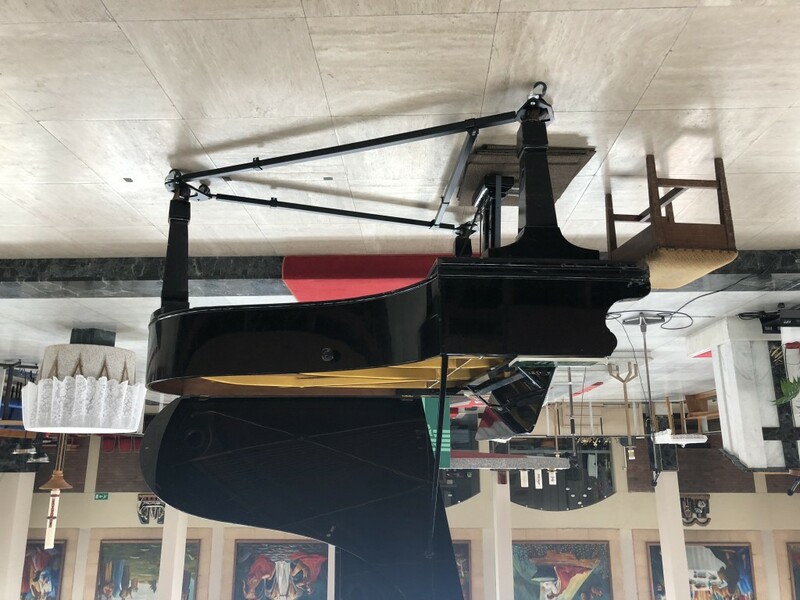 The target is £15,000 (cost of restoration/replacement) Any potential sponsors for the piano or donations for the appeal will be gratefully received. Present more concerts, recitals and collaborations with instrumentalists and singers for the community and wider audiences. Provide children and adults the opportunity to play and perform on the piano – especially those who do not have an acoustic piano at home, which is particularly beneficial for anyone studying music and taking exams. Plan special performances with other organisations, school and groups to further their music making and provide fresh opportunities for anyone who otherwise wouldn’t have the the opportunity to perform their music. We are having a fundraiser and if you or anyone you know; an organisation, sponsor or donor would be able to help here’s some more details..
We will keep a record of all of the names by listing them online, in our event programmes. NAME A KEY – Here’s how it works! If you would like to be..
Named as part of a group on a Community – C – Key! 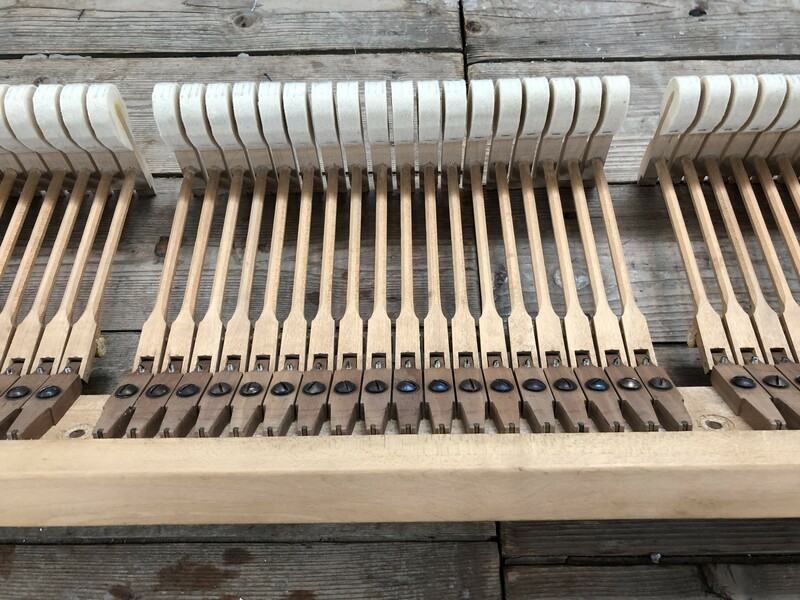 Each key has a letter and number that corresponds to the notes on the piano and we will write the name given to the key or the names of donors below. Or contact us via e-mail mail@merseywavemusic.com or telephone 0151-5591255 if you would like to arrange to donate in a different way. The first real piano was invented by Bartolomeo Cristofori (1655–1731) of Padua, who had been appointed in 1688 to the Florentine Court of Grand Prince Ferdinando de’ Medici to care for their musical instruments. In the period from about 1790 to 1860, the Mozart-era piano underwent big changes. This revolution was in response to a preference by composers and pianists for a more powerful, sustained piano sound. The Industrial Revolution enabled resources such as high-quality piano wire for strings, and precision casting for the production of massive iron frames that could withstand the tremendous tension of the strings. Over time, the tonal range of the piano was also increased from the five octaves of Mozart’s day to the seven octave (or more) range found on modern pianos (and that gives us 88 keys to name!) In the 1800s piano manufacturing and innovation was developing world-wide and by 1920’s the piano was a really important source of home entertainment, as well as being a sign of status – it was often put in the best room in the house, ready to show the neighbours and even attract suitors – a young lady who was good at playing the piano was often regarded as better marriage material! Piano sales today have more than halved and we want to recognise that the piano holds not only its social value today but also an educational value that is an asset to a whole community. It’s a form of expression that makes so many people happy, the piano was the instrument most used by the great historic composers who are the foundations of the music we know and love today, they are an amazing mechanism, work of art and we hope they will always be a big part of our music making here at St Ambrose!